Hard pressed to export Outlook for Mac to MBOX quickly but you have no idea how to do it? This tool from USL Software is simply your best bet. Literally just select the files you want to convert, and that’s it! Export Outlook for Mac to MBOX – It can be simpler, if you have right tool or methods. Here is how you can do it without any loss of data. You are hard pressed to export Outlook for Mac to MBOX quickly but you don’t know how. Email migration task like that can be intimidating for both experienced users and beginners. Unfortunately, there’s no quick and automatic method in either of the client to get the job done. There are several of the manual methods that you can approach for. These too can be time consuming and may not result in accurate conversion. For example, you don’t have to get OLM files from Outlook for Mac. If you have Outlook for Mac installed, you can drag the folders on your Mac desktop and the folders will be converted to MBOX files. But this has to be done for each folder separately and doesn’t apply to contacts and calendar data. Another example of manual method is using a dummy email account to sync the data to the email client where you want the MBOX files to be imported. For example, if you want to export Outlook for Mac to MBOX because you want to get the data into Thunderbird, you can skip the conversion of files and use a dummy email account, add it into both email client, sync the local data into the servers and back to the client (Thunderbird). If it’s not evident from the above passages, those methods are incredibly slow, inaccurate, and not worth your time. First of all, they are hard to pull off completely, but even if you did, the results would be data loss and compromises to the integrity of your files. You can expect dozens of items missing, prominently items like images, attachments Unicode text, and more. Therefore, may experts would recommend you try a third-party tool that have the proper algorithms and UI to take you through the process systematically. Now that would be simple if they are easy to find. Even the third-party professional tools don’t have what it takes to export Outlook for Mac to MBOX correctly. Most of them do not simplify the process and eliminate what are called unnecessary steps and actions. You would still be required to go through a long, tiring procedure. Wouldn’t it better if you just have to load the files and that’s it? Well, good news: “OLM Extractor Pro” from USL Software does just that. It is developed by USL Software and is exactly what you need. The UI is developed carefully so as not to overwhelm the basic users. 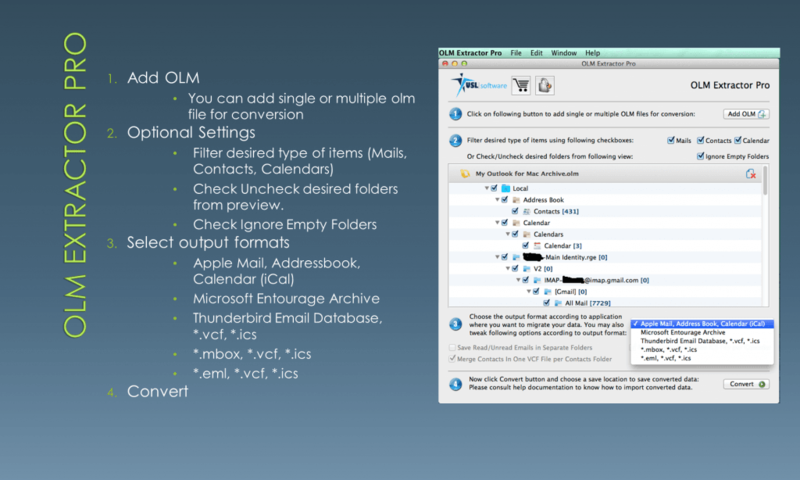 All you have to do is get your OLM files from Outlook for Mac and load them on to the tool. If you know any simpler and more effective approach than that, we don’t know what that could be. OLM format the native files of Outlook for Mac and by using them for exporting data, you get the most precise data export possible. 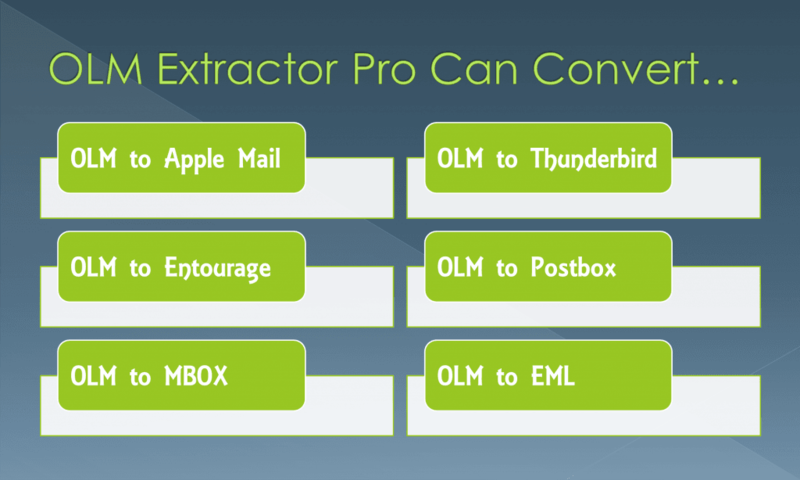 Apart from that, “OLM Extractor Pro” also features some unique control options that make the job more productive, customizable, and overall more suitable for everyone. For instance, the tool not convert only converts and calendar entries into VCF and ICS files respectively, it also lets you merge items per folder into a single file (VCF/ICS). The batch conversion option lets you convert multiple OLM files in one go. Also, the option to filter folders from your selected OLM files allows more tighter control over what you want to convert and what you don’t, without going through sophisticated exclusion tasks in raw files. Select one or more olm files and click on “OPEN”. Basically, the tool is simply point and click and all the functionality is intuitive to understand. Give it a try here. You will not be disappointed.